Once called Morocco City, Marrakesh is a thriving labyrinth of a marketplace with a constant festival atmosphere. 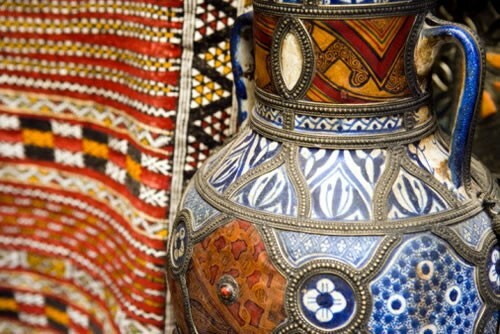 Here you can barter for all types of crafts, explore ancient palaces, enjoy street performers, or have a lunch of Tagines and chicken couscous on a rooftop terrace in Dar Neijarine. Morocco is known for its bazaars, and the medina (old city) of Marrakesh is perhaps the busiest marketplace in the entire African continent. As you wander through the ancient walled streets of the medina you may feel overwhelmed by the diversity of goods for sale, but remember that these vendors expect you to bargain. You can buy anything here from traditional babouche slippers, kaftans, hand-crafted jewelry and leather goods, to ancient Berber herbal remedies, spices and carpets. Hang around the Jemaa el-Fna square until night begins to fall, and out will come the food vendors, water sellers, acrobats, story tellers and chleuh, the dancing boys. In addition to the bazaars, Marrakesh was once an Imperial City and is home to the amazing Pasha’s Palace in Dar El Bacha, and Bahia Palace. You may want to enlist a private guide in Marrakesh to help you plan exciting excursions to wonderful attractions such as the Koutoubia mosque and minaret, or the royal Saadin tombs. Your time in exotic Marrakesh will be unforgettable. 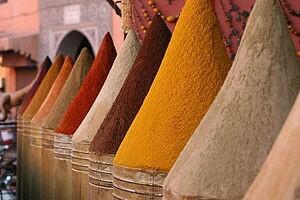 There are very few cities in the Northern Africa that have the same charm and beauty as Marrakech. Even despite the fact that it’s the fourth biggest Read more.